The powerful poster of the much-awaited Diljit Dosanjh’s period film ‘Sajjan Singh Rangroot’ is out now and it is sure to blow your mind. 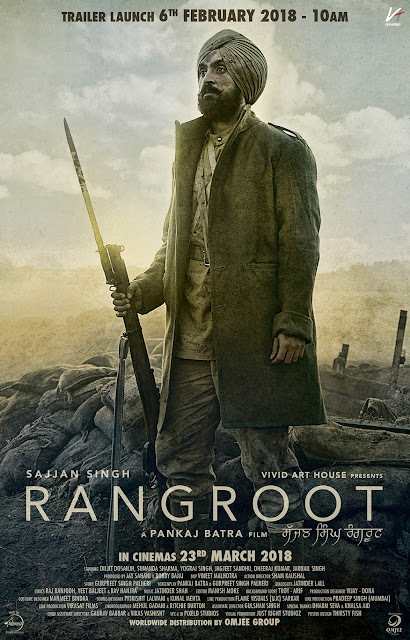 Directed by Pankaj Batra, who has previously directed popular films like ‘Goreyan Nu Dufa Karo’ and ‘Bambukat’, ‘Sajjan Singh Rangroot’ is set during the British rule in India and is a fictionalized version of the time when Indian soldiers were sent off to fight Germans during World War I. Talking about his dream project versatille singer-actor Diljit said "I feel blessed to be a part of this prestigious project. It is indeed my dream project and is closest to my heart." Written by Gurpreet Singh Palhadi, the film highlights the hardships faced by the Indian army during World War I and how they tackle every difficulty under the guidance of Subedar Zorawar Singh. The movie also touches upon the time when the British army honoured the contribution made by Sikh soldiers during World War I. Thousands of Sikhs from the Indian sub-continent fought and died for Britain during this conflict. As a sign of respect to their victories and transparent thoughts, the government of Britain till today holds ceremonies for Punjabi war soldiers. Sajjan Singh Rangroot also marks the debut of renowned Punjabi singer Sunanda Sharma. The film is produced by Jay Sahni and Bobby Bajaj under the banner Vivid Arthouse. The film also stars Yograj Singh, Jarnail Singh, Jagjeet Sandhu, and Dheeraj Kumar and is slated to release on March 23, 2018.